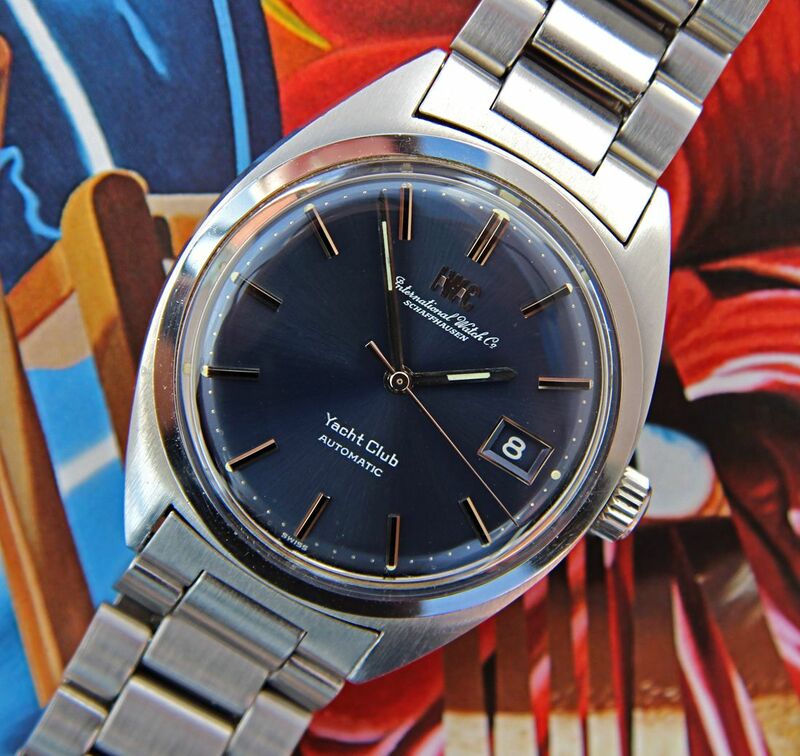 Up for sale is this stunning 1970s IWC Yacht Club in stainless steel with gorgeous blue dial on a very uncommon German-made "President"-style bracelet with ratcheting clasp. Making this already cool watch even cooler it amazingly comes with its original box and a raft associated matching papers, wonderful provenance and true collector's set material. This elegant and sporty timepiece from International Watch Co. of Schaffhausen features the legendary in-house Pellaton-winding automatic caliber 8541B with semi-quickset date and hacking features, the ultimate development of IWC's wonderful automatic calibers at the time. 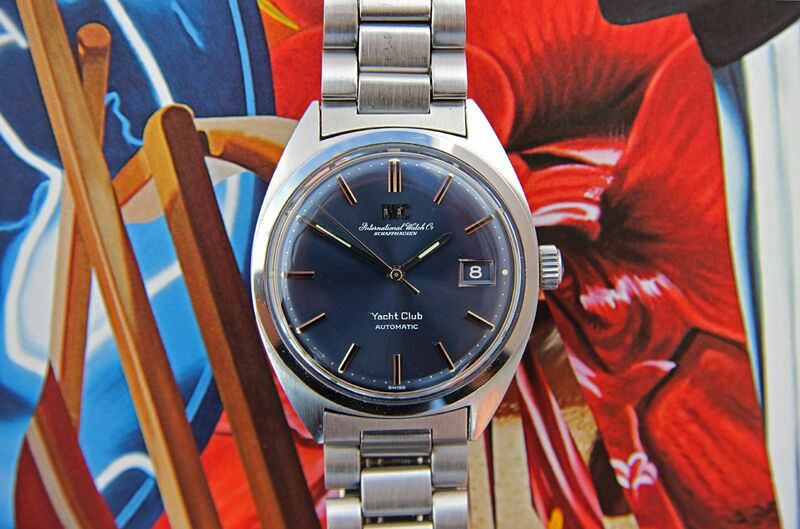 The original Yacht Club was IWC's most successful attempt to thread the sports/dress needle during the funky 70s and, as you might surmise by the name, was aimed at an upscale clientele who wanted both classy modern looks coupled with excellent water resistance. 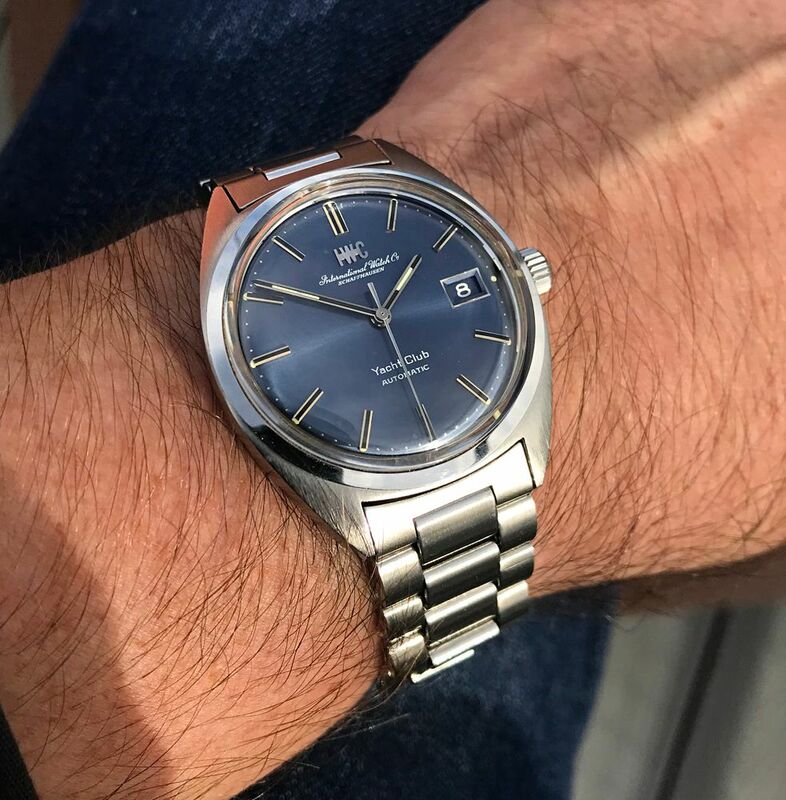 This Yacht Club, technically reference 1811 AD, features a robust all-steel case with screwed back and oversized water resistant "Fish"-logo crown. According to the database the movement dates to circa 1973-75. 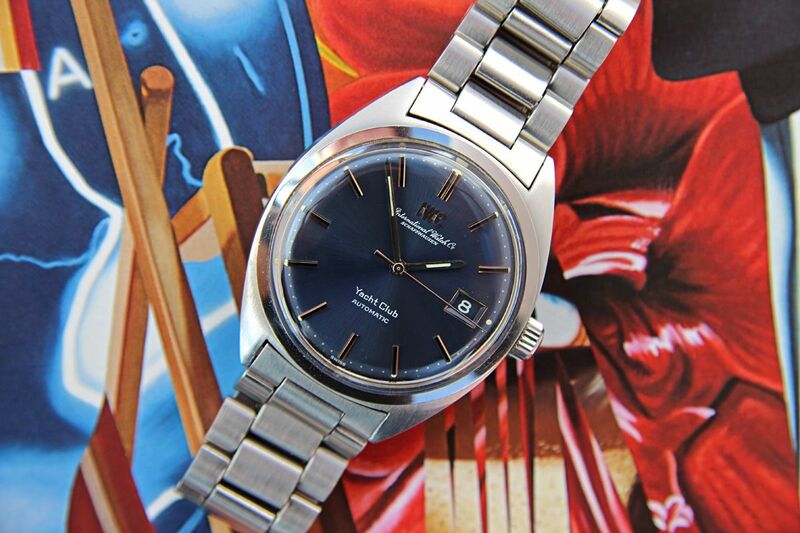 The beautiful blue dial is Near Mint and all original and the case has very sharp edges and appears to have never been polished or perhaps only refinished to spec at IWC. 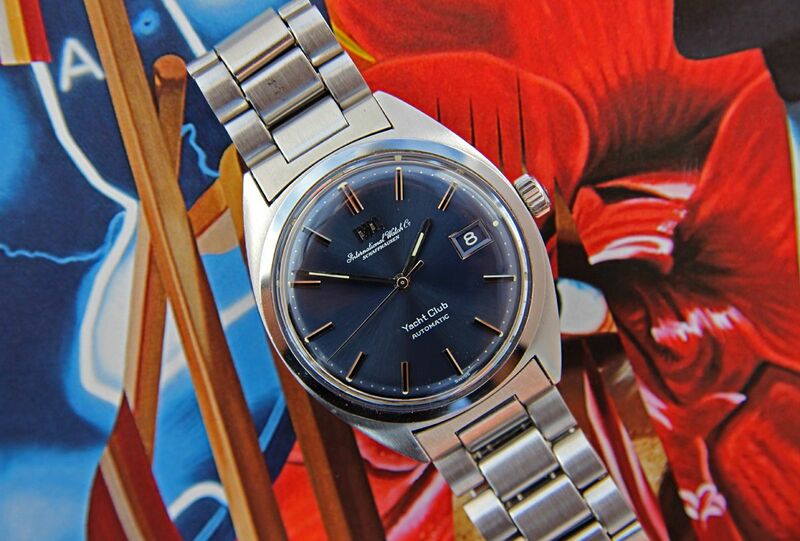 Best of all, it comes with its original period box and several associated papers, including the original dealer-stamped International Guarantee, the dealer’s sales receipt and a couple of later service records from IWC. Also, since most of these have only survived head-only finding one on its signed period bracelet is a major plus and this ratcheting clap version is one I’ve not seen before. 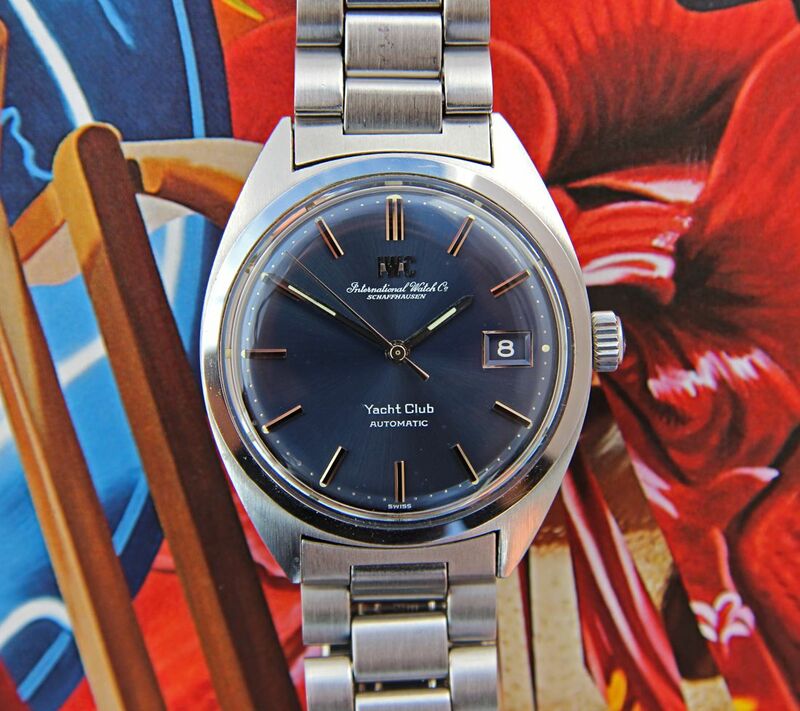 This great Yacht Club is in overall Excellent vintage condition, was last serviced by my watchmaker in 2015 so is running strong and ready to make a statement on the wrist and in the collection of its discerning new owner. The asking price for this stunning blue IWC Yacht Club collector's set is now further REDUCED to $3,650 USD OBRO including fully insured FedEx shipping worldwide. Bank Wire is always preferred but Paypal is OK with split fees (+2% to the buyer). Payment must be made in US DOLLARS. Watch will ship upon full clearance of the funds, as well as any necessary bank vetting. 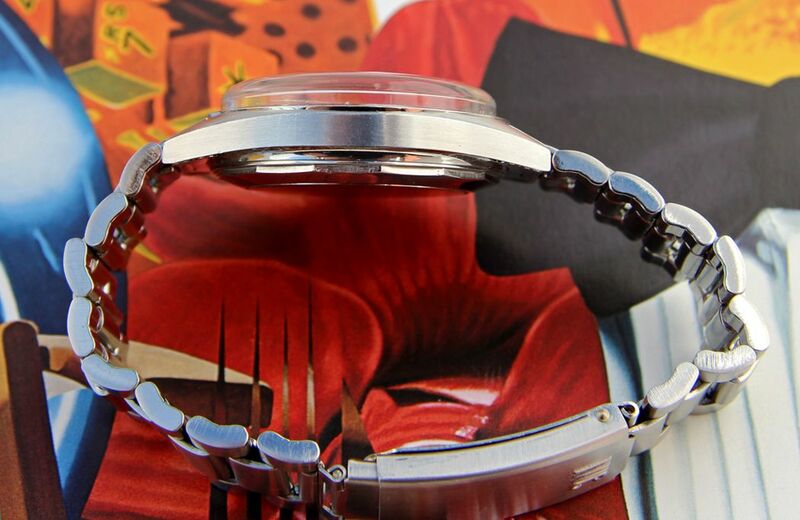 CASE & BACK: Heavy but elegant 36mm wide (not including crown) x 44mm long x 13mm thick (to the top of the very tall crystal) solid steel 2-piece "C"-shape case with screwed water-resistant polygon back and polished integrated bezel. Case does not appear to show any prior polish and displays crisp edges and contrasting original factory satin finish (could potentially have been refreshed at one of the IWC services but I kind of doubt it). It shows some light scratches and one or two small nicks -- Excellent+ vintage condition. 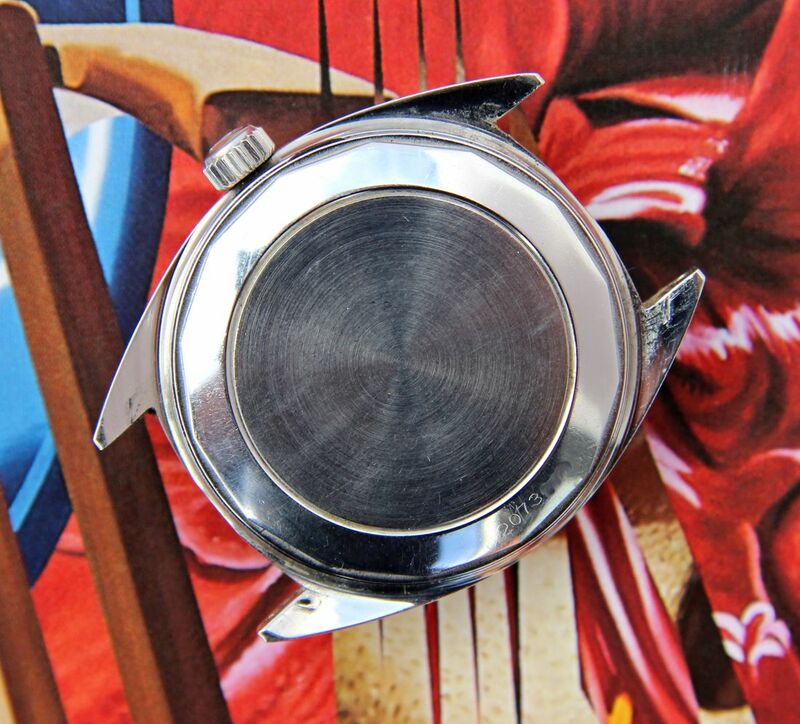 Screw-in water resistant-style caseback also has a few light scratches, likewise Excellent+ externally with original factory spiral pattern and a serial number that is still clearly visible on the outer lip. 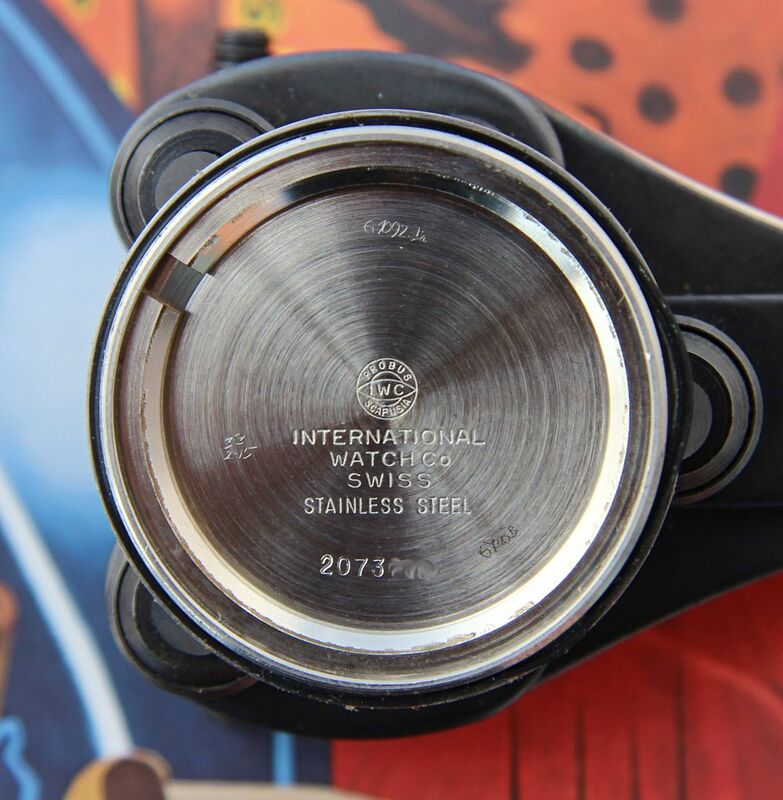 Inner caseback is corrosion-free and also engraved with the serial number, as well as all the other correct IWC nomenclature of the period including the famed IWC “Probus Scafusia” logo. 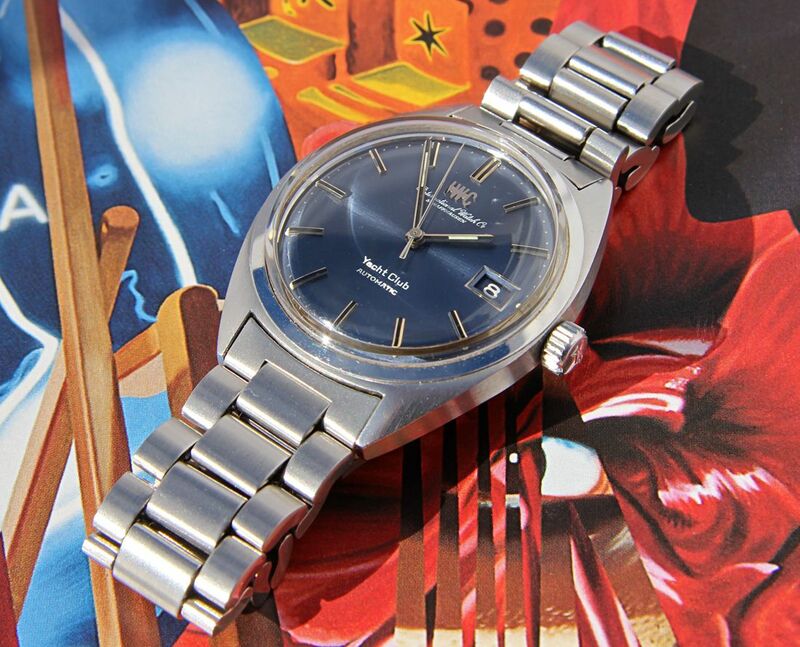 DIAL & HANDS: Beautiful and absolutely Near Mint blue sunburst dial with applied black & silver markers, luminous dots & framed date window (any marks seen in the photos are on the vintage crystal). Correct white-print-on-blue-background date wheel. Elegant lume-filled hands with black inlay and baton sweep seconds are Mint. 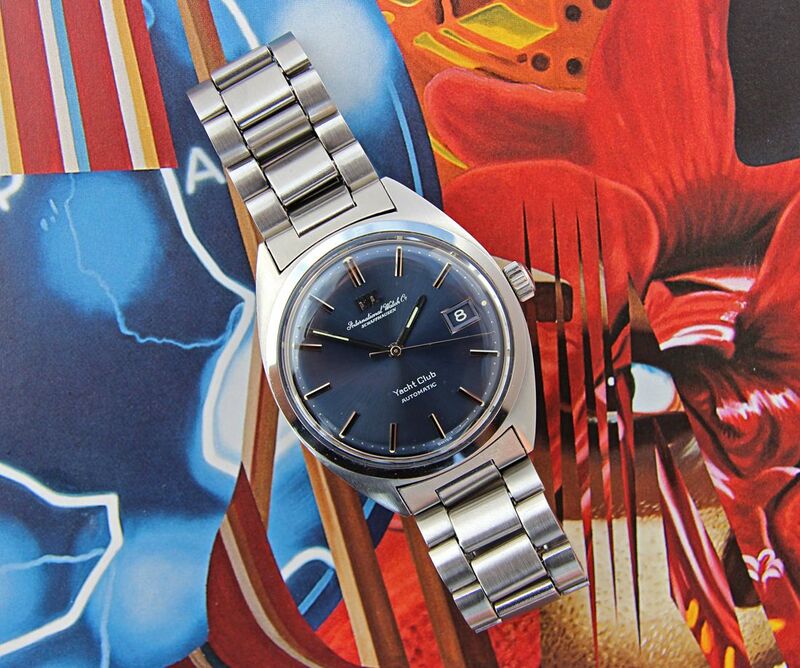 All original dial text is crisp and present. Hands and dial lume match perfectly though a few of the dots on the dial have degraded somewhat. 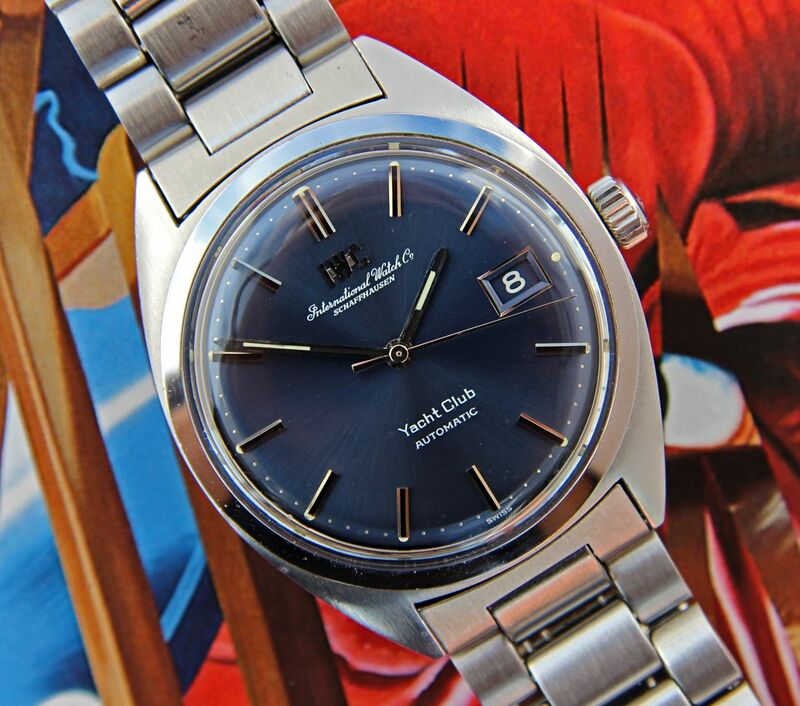 Simply a gorgeous blue dial and one of the few I have seen from this era that does not suffer from discoloration to the blue pigment from interaction with the Tritium luminous. CROWN: Original large IWC "Fish" crown in Excellent+ cosmetic condition winds smoothly and pulls out to the hacking time-setting position, as it should. CRYSTAL: Very tall, high-sided vintage domed acrylic crystal has mostly minor marks, one or two slightly deeper scratches and is quite clear — Excellent overall. 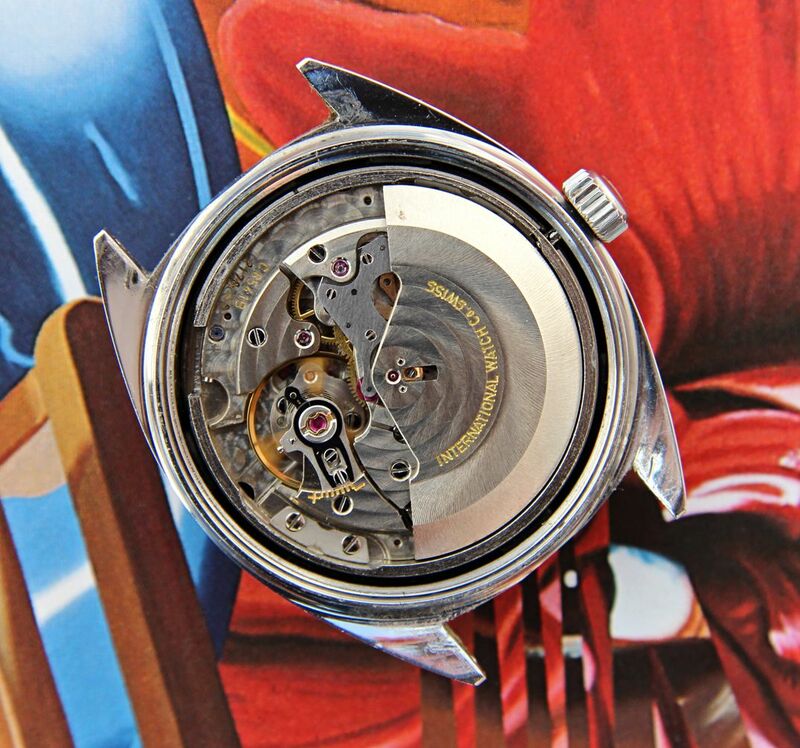 MOVEMENT: Legendary IWC caliber 8541B 25-jewel automatic-winding, hack-setting movement is clean and running very well. The date is semi-quickset, meaning it can be set rapidly by repeatedly moving the hands back and forth between approximately 9:30 PM and Midnight. I last had this terrific movement fully overhauled in 2015 and so it is keeping excellent time with all functions operating as they should. This is guaranteed to be the case at the time of shipping. BRACELET: This classic Yacht Club comes on its scarce original German-made President-style bracelet with big logo buckle and uncommon ratcheting clasp. 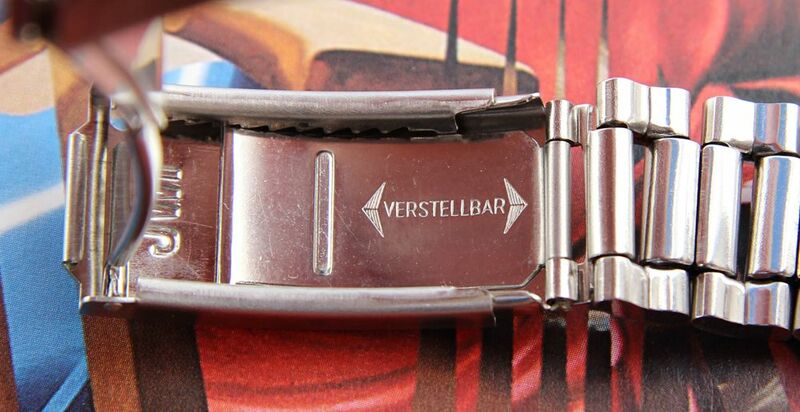 With this bracelet you open the clasp and push a sliding part inside the buckle to adjust the size either larger or smaller (“Verstellbar” means adjustable). 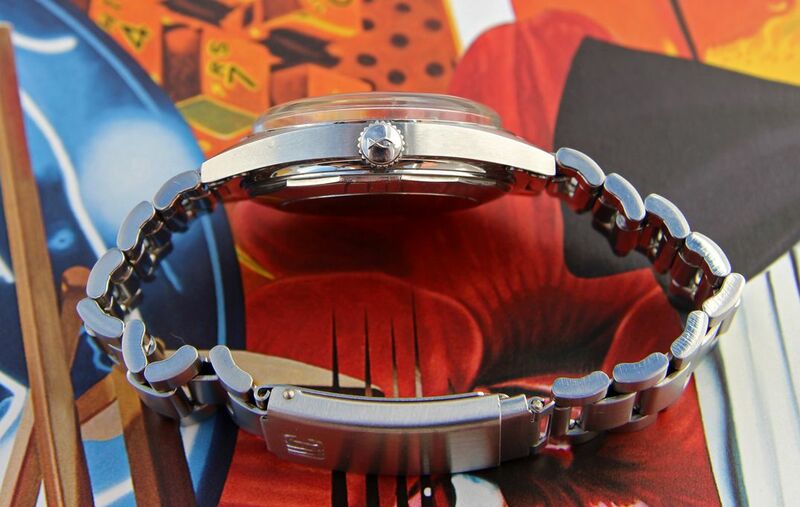 The best result comes when you open it to the maximum extension, put it on your wrist and then tighten it click by click until you get the desired fit. It is in overall Excellent condition with some stretch and very minor marks from use and the logo part of the clasp is very clean. At full extension it will fit up to about a 7 3/4" wrist and at minimum a little under 7,” I think. The lug with of this Yacht Club is 18mm. 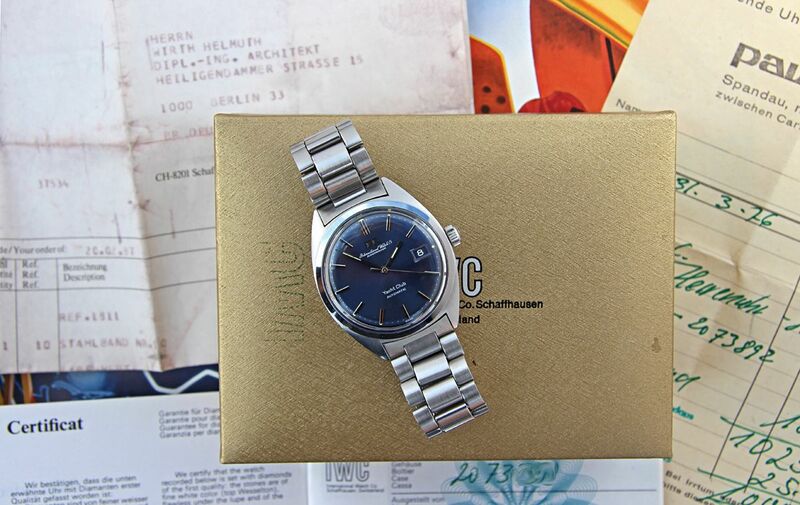 BOX & PAPERS: Taking this cool blue Yacht Club to the next level, this survivor comes with its original period gold colored box and a ton of matching paperwork, including original filled out & dealer stamped guarantee booklet from 1976; original sales receipt from retailer Paul Wagner in Spandau, Germany; an IWC service receipt from 1985, the famous “credit card” that we know and love to this day; and a receipt for hat looks like a bracelet purchase from 1987, as well as the original signed plastic “wallet” of the period to hold them. 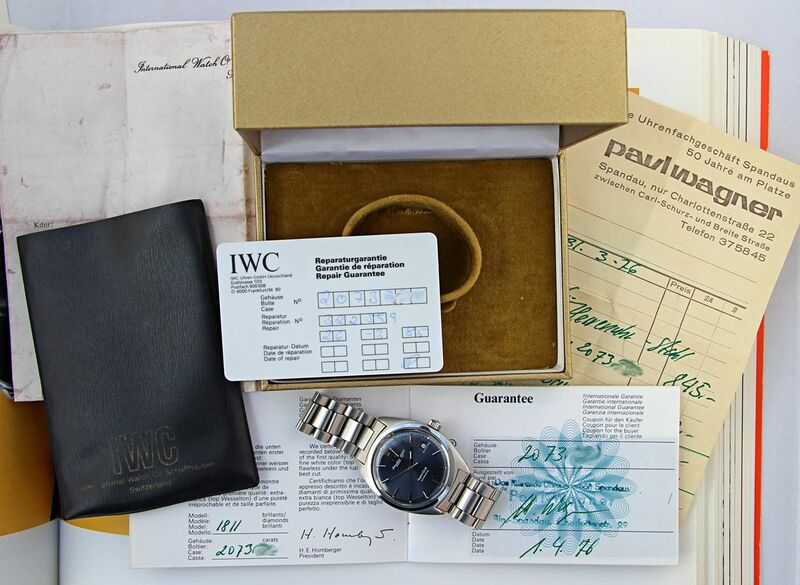 Truly a rare collectors’ set and wonderful provenance to accompany this great IWC! 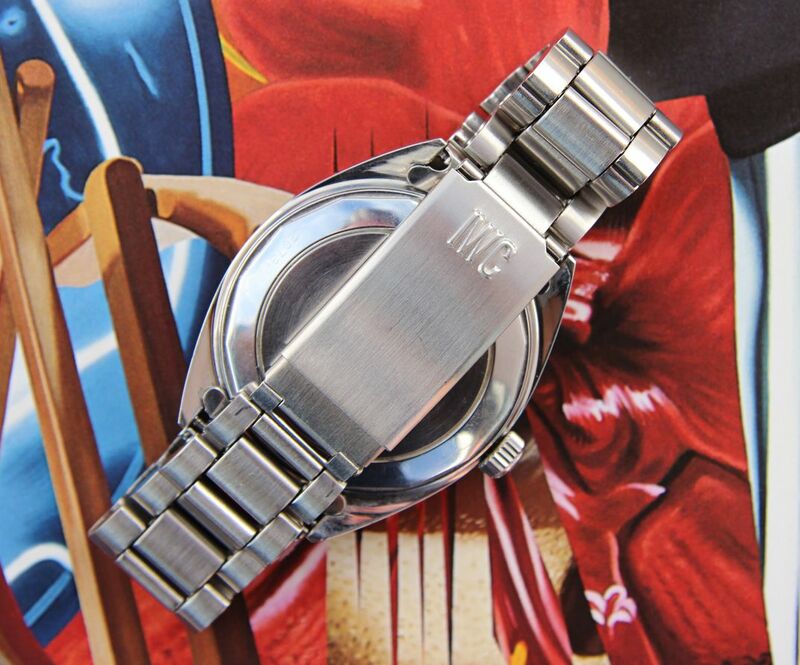 As a matter of policy, I make NO guarantees for the water resistance of this watch in any way, shape or form. 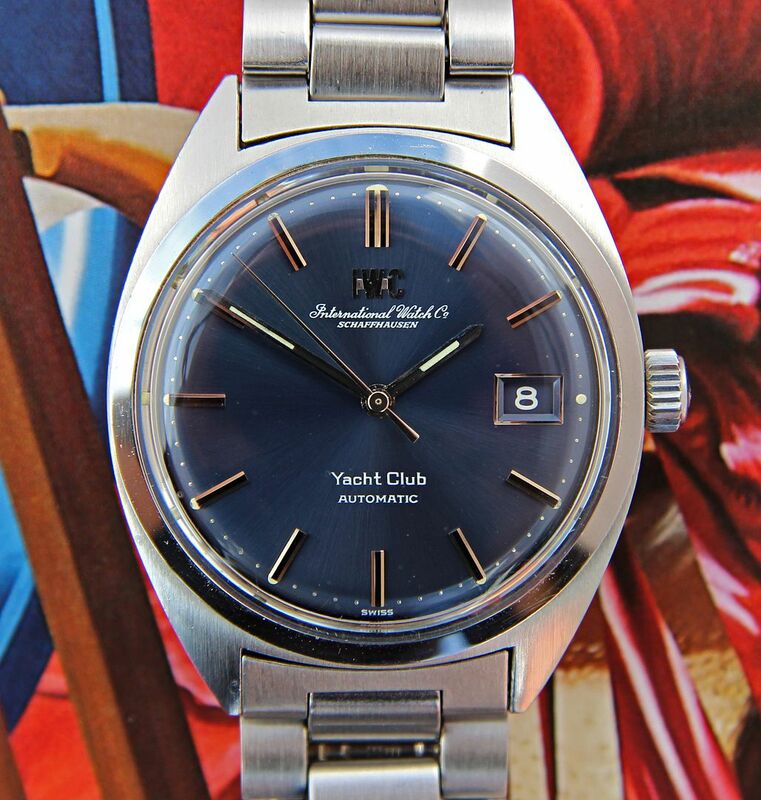 This classic vintage IWC Yacht Club is offered with a 3-day inspection period from the date of receipt and may be returned for a full refund (less any shipping costs incurred by the buyer). This refund is unconditional and once I get the watch back in exactly the same condition as it was sent to you, your money will be refunded. Of course, once the 3 days are over the sale will be considered FINAL.